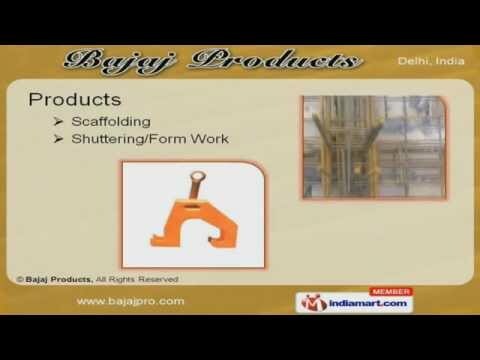 Welcome to Bajaj ProductsManufacturer & Exporter of Construction Support EquipmentsThe company was established in the year 1975. We cater to Power Plants, Hotels & Highways acrossSaudi Arabia, Dubai & Iraq. We are well known in the market for our good financial position & TQM, large production capacity & CAD / CAM designing facility. Our Scaffoldings, Shutterings & Form Works are widely acclaimed in the market. We are specialized in Adjustable Base Jacks & Quick Wedge Systems. Cuplock Systems & Scaffolding Planks are some of our best selling products. Along with that we offer Coupler Fittings & Steel Couplers that are a class apart. Frame Systems, Props & Shoring are some of our best selling products. We also offer Wall Forms, Form Works & Miscellaneous Accessories.